EXCLUSIVE: THOUSANDS of city commuters will be hit with big fare increases to pave the way for the myki smartcard. The decision to dump city saver fares will mean most myki tram users only have to swipe the card once – when they enter a tram. Touch-off on trams was never going to work. At busy stops dozens of people could be getting on and off all at once, leading to chaos and long delays if they all had to touch-on and touch-off. This change makes sense — though if you were a regular user of City Saver fares, you’d be understandably miffed. So there aren’t that many. A little bird says 6000 per day, which in the grand scheme of things is a drop in the ocean. City saver fares stretch to Richmond, South Yarra, Carlton, North Melbourne and Docklands. Not South Yarra — the closest it gets is Domain Interchange. And only some parts of North Melbourne and Richmond. See the map. Overall this is a good move, and hopefully means we’re getting closer to seeing the long-running Myki implementation finally nearing completion. PS 8:10am. How it will work — the zone 1/2 overlap will be extended to the end of the three routes that currently go into zone 2. So the default fare (that is, if you touch-on but don’t touch-off) will normally be a zone 1 fare. If you travel entirely in zone 2 and want the cheaper zone 2 fare, you’ll still need to touch-on and touch-off. This isn’t as good as it sounds, as they’ve introduced a glaring inconsistency: you need to touch off if you’re travelling on a tram route that spans zone one and zone two and you’re only travelling in one of the zones. People don’t deal with inconsistent systems well. There will be complaints when people make a short trip on a tram not realising it’s one of the exceptions and then get charged for the other zone. @Vas, only if you’re travelling entirely within zone 2 and want the zone 2 (cheaper) fare. Otherwise, anybody not touching-off will get charged the zone 1-only fare. You’re right though, it’s inconsistent with other modes. And yes, so much for the concept of the shiny new system matching Melbourne/Victoria’s requirements exactly. Why can’t they do this with buses then, and fix all the problems in one go? Surely buses could just be allocated a single zone in which they exist. Most people’s trips on a bus would be within one zone unless they happen to straddle a zone boundary. A long trip on a bus, crossing zone boundaries, would be unusual. So just assume that any ticket that boards a bus in a zone will travel only in that zone. Can’t it be done? It’s never been entirely clear to me why the inner city warranted it’s own slightly lower fare option anyway. People in, say, Ringwood, Balwyn or Werribee manage to pay for a generic one-zone ticket for trips within similarly narrow ranges. The Herald Sun’s hysteria on that point is a bit hard to swallow. I wonder how much it would really cost them to scrap zone 2 entirely for trams? Thanks for the update on HOW this is planned to work- absent from the HS article. It’s no more inconsistent than any other thing we’ve been told about the system. Am I right in thinking that one impediment to making trams all zone-1-only is that passengers on those three lines are currently able to pay a zone-2 fare for short trips (or connections to other modes in zone 2) in the outermost stretches of those routes, thereby paying less than a zone-1 fare? That is a good Idea. But if the machine is not touched off then there will be a big bill. @Philip, it probably makes sense on most buses, but the Eastern Freeway routes are a significant exception, where long two-zone trips dominate. @MC (comment 6), it’s actually the 75, not the 74. The HS got it wrong. @jon, they could do that, but that means local trips within current zone 2 would jump in price, particularly if connecting to zone 2 bus/train services. @MC (comment 9), correct. Yes, they probably should bring the zone 1 fare down to match, but that wouldn’t solve the problem on its own, since a z2 bus + tram trip would still be a two-zone fare, even if currently all within z2. @Phillip, I have no idea what you’re talking about. If you ignored the fact that city saver existed, you only had to touch off on the tram routes that go into zone 2 anyway. Would be easier just to change the marketing rhetoric so the world didn’t end if you didn’t touch off. Whilst I’m glad they’ve finally confirmed this is definitely happening, it’s obvious we should not have had to wait so long to reach a decision. 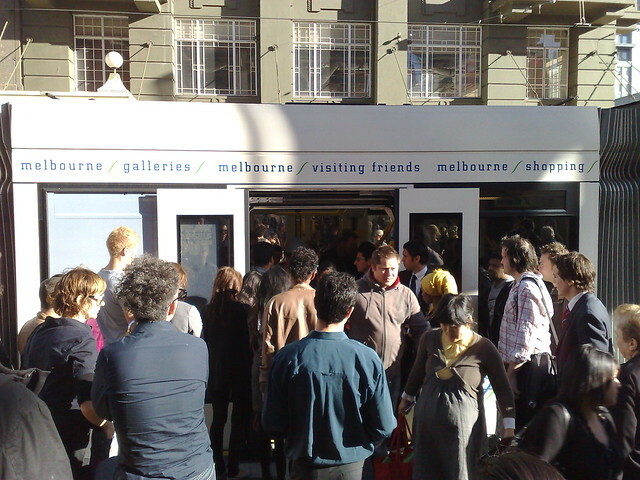 In reality, at least in my opinion, they should have dumped city saver with myki from the very beginning anyway, then we probably would have had myki on all modes at the beginning of the year, not to mention they would have saved all the money of developing the borked city saver functionality on the trams and buses in the first place. They probably also need to extend the zone 2 overlap to at least Box Hill otherwise the 109 is going to be horrendously crowded to at least it’s closest point to Mont Albert Station. A tram from the city to Box Hill will be a zone 1 trip, a train from the city to Box Hill will be a zone 1 & 2 trip – not exactly a fair fare. And to harp on about it, what improvement is myki over the current system? $2.50 for six hours from initial validation across the system – no zones. Won’t stop evasion on trams or suburban rail but nothing bar barriers at point of entry and exit will achieve this. An option that can be implemented but the leaders are to weak to implement. > will be a zone 1 & 2 trip – not exactly a fair fare. As will a 302 bus from the city to Box Hill. In fact the 302 bus has the shortest Zone 1 of all modes to Box Hill. On a 109 tram Zone 1 will take you to Union Road, soon to be all the way to Box Hill. On a train, Zone 1 will take you to Mont Albert station (about 600 metres past Union Rd. But on a 302 bus it will only take you to Balwyn Road. I commented without seeing the “How it will work” update earlier. That actually seems eminently reasonable. And probably quite workable. As Brendan said: thanks for that detail!! No city saver fares ? So if you want to only go three stops, use a bike ! @Nathan, yes, this is something that should have been decided years ago, not in (what you’d hope) is the final months of implementation. While I agree z2 to Box Hill (on trains) would make sense, I doubt without it it’ll result in crowding on the 109. Most people care more about speed than price. Times for Box Hill to Parliament: peak times: train express 18 mins vs 51 mins. Off-peak train stopper 25 mins, tram 45 mins. Even tram to Mont Albert/walk to the station/catch (stopping) train would take extra time. But yes, the inconsistency just underscores what a mess this is. @Nigel, remember Myki covers most of Victoria. Zones will be needed at some level. @Jon, true. But the number of people affected is limited because most people using PT in the city use a Z1 or Z1+2 ticket, not a City Saver. It’s those who drive in, or live in the city, who are most likely to be using it. I’ve been trying to work out how much extra you’d pay if you were using City Saver every working day. The opposition claimed up to $500, but I’m not so sure. For bulk tickets, it’s 76 cents per trip extra ($2.18 vs $2.94), assuming the trips are in different two-hour periods. 48 weeks x 5 days a week x two trips x 76 cents = $364.80. For single City Saver vs Daily, it’s 2 x $2.80 vs $6.80, so $1.20 extra per day = $288 per year. You wouldn’t intentionally use it more than twice a day because a Daily would be cheaper. If you’re sensible you wouldn’t use it on weekends or public holidays (at least not more than once) because the Weekend Saver rate ($3.10 or $3) would be cheaper. Currently, MYKI charges me $2.18 for a trip from Parliament Station to Richmond (where I touch off). If I then touch on again and continue to Brighton Beach, I get charged at additional 76 cents (making $2.94 in total). So doesn’t MYKI currently have the capacity for CitySaver fares? if “the zone 1/2 overlap will be extended to the end of the three routes that currently go into zone 2”, wouldn’t that mean a tram trip from Box Hill to city will only cost a zone 1 ticket? I can see a lot of people who live in Box Hill catching the tram to Mont Albert to change train. Similarly, those going to Box Hill from the city will get off the train at mont Albert and change tram. They might as well extend teh zone 1/2 overlap to Box Hill station. I don’t understand why City Saver fares have to be scrapped at all. Remember, Myki is fundamentally a computer system – it can do anything it’s programmed to. So if people DO want to access a City Saver fare, all they would have to do is touch off and it could calculate that as appropriate. If they don’t touch off, it would charge the full 2 hour fare as normal. Obviously the intention is to avoid having to touch off on trams but if City Saver really is used so infrequently the number of people who would want to touch off would presumably be minimal. Why couldn’t they just install Myki scanners outside, at certain tram stops (the ones which see the highest-use)? Like the Myki readers you see at the entrances of suburban/regional train stations. You would still have Myki readers on board, for getting on/off at normal stops. But for high-use tram stops at peak time, it would be a lot more efficient if you could scan on/off as you walk past scanner(s) at the tram stop, instead of trying to scan whilst scrambling on/off a packed tram. Apparently they don’t want to allow touch-off to get the City Saver fare for consistency, and also because they think it would cause too much disruption. However given it’s such a small number of people, I have my doubts about this. @jon (comment 24, different Jon to the other Jon, it looks like), readers would need to be consistently placed, otherwise you might not know if you’re getting off at a stop that has one or not. You then run into problems with vandalism etc as well, which may mean you need 2+ at every stop just in case. But perhaps that’s not insurmountable. I seem to recall London has ticket machines at some bus stops, to reduce purchase from drivers on busy routes. Good news for me. Now going into the city from Vermont South by tram is entirely zone 1. A money saver! Here’s a question: aside from a) people who live in the city saver area and can therefore afford the fare increase and b) people who drive to the city then use city saver fares, who should be using other zones as well, is there anybody, at all, who is actually affected by the abolition of the City Saver area? I think this issue has been hijacked by Melbourne’s newspapers or poorly sold by the government. People are mainly talking about the loss of city saver, and no mention is being made of the benefits of making the whole tram network a single zone. * It makes the whole tram network simpler. 1 single ticket can now take you anywhere on the tram network. * A few people living in zone 2 have commented that this will make their fares to the city cheaper, as well it should, the ride to the city takes 1 hour +. The elderly and less advantaged in these outer suburbs now have more access to services into the city. * From the city to the suburbs, this will also reduce the burden on international students and student living in other suburbs travelling to latrobe bundoora and deakin burwood. * It also ties in with Rob Adams and the governments transport cities strategy concentrating development along tram and bus corridors. You can bet making the Box Hill stop zone 1 will ramp up development in the Box Hill district. @David – I live in Richmond and can’t necessarily afford the fare increase. Not everyone who lives in the City Saver area is a wealthy converted-warehouse-living yuppie. Try working part-time, attending uni full-time and not receiving government benefits. Every little bit counts. Spending $2.10 for a short trip in to the city ends up saving me a bit of cash and is also better value for money…why should I have to pay $3.70 for a 5-minute train trip? It’s stupid. @Louise, sounds like the tickets will continue to be sold and be valid while Metcard is around. The only reason I can fathom for this whole “touching” business is so they can accurately record trips. Apparently this was what the Metcard was supposed to do and the total changes brought about by that – ZERO. I’d love to know in a few years’ time, what changes have been made using the information gathered by the myki system. @Louise, if you commute regularly then are you able to use a periodical ticket, like a monthly or yearly? Keep in mind that with Myki, any periodical ticket between 325 and 365 days costs the same amount, so you get just over a month free. Granted it’s a massive outlay, but there is a very big saving to be had, and that means every trip will be cheaper. Is that enough to pull down the per-journey fares to a more manageable level? @David, I don’t commute that regularly anymore using PT. I try to cycle as often as I can, with rained-out trips into work supplemented by use of the City Saver. As I mentioned, I am on a pretty…okay, very, tight budget and could no way afford to fork out more than $100 a month on a monthly Metcard…even the increase in fare and decrease in value for money with the City Saver will most certainly affect me. Thanks Lana. Judging from Jon Stanhope’s statement (link below) it’s based on the Perth Smartrider system (thus, mature technology, unlike Melbourne’s Myki) and will cost a whopping $8 million! Thanks Daniel :) I should read the pollie’s website more often. I still think tag off is going to be hell at ANU, or any interchange for that matter, of a morning! It will cost about $23 per person. That works out to be a hell of a lot cheaper than Myki – $1.3billion into 3.8million (ABS – 2007 Melbourne) is $342 per person, so I’ll not whinge and moan. At least, not in a Melburnian’s hearing.